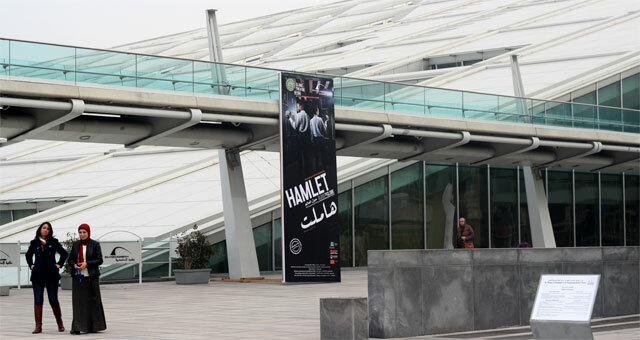 When on 12 January, the Globe Theatre staged Hamlet at the Bibliotheca Alexandrina, Egypt was the 67th stop on the renowned London theatre troupe’s world tour. The company moves fast in its ambitious project aiming at performing the iconic Shakespearean tragedy in over 200 countries over the span of two years. Since their show in Alexandria, The Globe has already performed in Eritrea and Sudan. Its upcoming show is scheduled on Thursday 22 January at the National Theatre of Addis Ababa, Ethiopia and it will bring the number of the visited countries to 70. “Totus mundus agit histrionem,” (All the world’s a stage) is believed to have been inspiration for the historic Globe’s name. 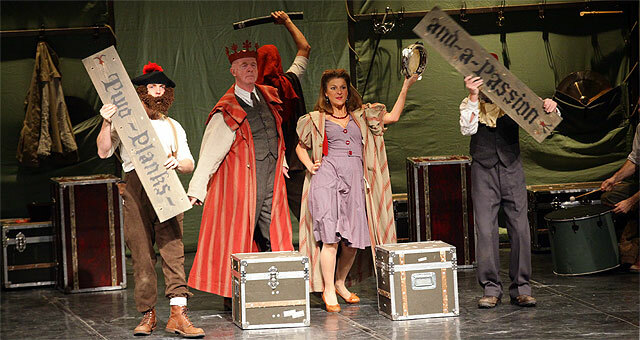 Today, still faithful to the theatre’s motto, like the travelling players, the troupe moves across the world, joining the many tracks of Marco Polo, Vasco De Gama, Ibn Battuta and the like, trespassing borders and cultures. The play is staged in theatre halls, cultural centres, open-air theatres, cathedrals and even on the beach, proving how easily they can all turn to typical Elizabethan playhouses or inn-yards. The Globe theatre began the tour with Hamlet in April 2014, paralleling the celebrations of the Bard’s 450th birth anniversary. It will continue its journey until April 2016, when the world will celebrate Shakespeare once again, commemorating his 400th death anniversary. Not only does the Alexandria performance take place on around the 100 thousand kilometre mark of Hamlet’s travels, the play has a particular positioning in Egyptian theatre’s history. While quoting Litvin, Selaiha adds even more examples to the dissertation’s long list of Hamlet performances that the Egyptian theatre witnessed throughout the decades. Egypt is probably one of the interesting case studies serving as a living platform on which the universality of the iconic play can be exercised. The meaning of life, the mystery of death, the man-made evil where the evil known seems better than the uncertainty carried by ignorance, dilemmas of the young stepping into the hardships of adulthood – are among the many iconic universal values that the Bard’s text provides in its entirety and which are fantastically encapsulated in Hamlet’s famous soliloquy. Today, over 400 years later, and after Litvin’s four phases of Hamlet in the Arab theatre were defined, the play manages to resonate, time and again gently melding with the Egyptian theatrical and cultural consciousness. Understandably, when staged by the Globe Theatre, Hamlet was an immediate magnet for the audience. A credit for the transmittal of the play’s values and their accessibility to Egyptian and all international audiences, lies in the intelligent mise-en-scene by the remarkable British theatre director Dominic Dromgoole. Dromgoole pulled from the Shakespearean text the myriad of contrasting colours, respecting the tragedy yet cleverly emphasising the comic segments. Though according to some preconceptions placed on Hamlet, this procedure betrays depth of the tragic material that Hamlet ought to deliver, it is the joviality of several segments that created the shocking and engaging juxtaposition between the characters and values presented. When a play juggles with contrasts, the audience easily captures the sharp colours, and easily relates to the meanings that each of them carries. The most evident such sharp contrast emerges in the Players’ scene of Act Three, where Hamlet’s plan to uncover the truth behind his father’s death is juxtaposed against a farce-like performance staged by Player Queen and Player King. In this crucial and in a way cathartic scene, the humorous becomes burlesque, a slapstick while Hamlet’s wish to “catch the conscience of the King” (III, 2) turns into a melancholic outcry of the calamity uncovered. By emphasising the contrasting characters, situations and themes encoded in the text, Dromgoole created a guaranteed recipe for success for a play travelling across many cultures and meeting audiences of many backgrounds. At the same time, the director puts the actors and challenges of touring into consideration. On the contrary to Polonius, Droomgool does not wish to “use them [the actors] according to their desert” (as they are deserved to be used). With 12 actors swapping the roles on each night, the performance is different every time. Except for Hamlet, played by two actors — Ladi Emeruwa and Naeem Hayat, most of the actors play up to four roles interchangeably. As they swap the roles they also excel in skills which, captivating acting aside, also incorporate singing and playing instruments as challenging as violin or accordion. As such Hamlet remains fresh and, as some of the actors revealed, develops each time it is performed. The mobility of the Globe is a lovely reminder of the era when troupes moved from one stage to another. The small company carries its costumes and scenography in boxes which in themselves become part of the set. It is almost a “poor theatre” that does not depend on complicated sets or mechanical sophistication to serve the play’s purpose. It was a pleasant surprise to find the 1,600-seats auditorium of the Bibliotheca Alexandrina full to the brim. Right before the opening, a few actors approached the audience and discovered that many had arrived from Cairo and some even from Luxor. A large number of young people in the auditorium can be considered yet another success of the evening even if a few of them found it difficult to refrain from answering their mobile phones during the play. Though disruptive to the majority of the attentive spectators, let us take it as yet another characteristic of the Elizabethan theatre, with history recounting the most astounding tales about the audience’s behaviour. Over three hours of a theatre play in Shakespearean English is not an easy feat for many Egyptian spectators. Dromgoole however found a formula to keep the younger audience interested while providing a sense of rediscovery of iconic Hamlet to those who have had a chance to see this play more than once. As Ladi Emeruwa said in one of the televised interviews given for a South African channel, by the end of the day, everyone draws something unique from Hamlet and it is our geographical, social and cultural positioning that allows us to relate to and enjoy the many diverse riches of this magnificently universal text.